Rattlesnake defenders. There may be no smaller minority in America. But despite the deeply seated terror they generate for the average human, naturalist Ted Levin is a devoted fan of all things rattlesnake. And there may be no snake more in need of a robust defense than the timber rattler. Once ubiquitous throughout eastern North America, Crotalus horridus has suffered ceaselessly as humans have waged an astonishingly cruel war on this remarkable – and surprisingly docile – species. 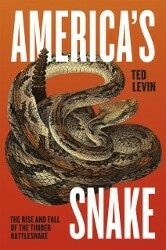 America’s Snake is Levin’s passionate and determined appeal for an immediate cessation of hostilities. Before it’s too late. But wait, what about snake bites? Aren’t rattlesnakes incredibly dangerous? Right out of the gate, Levin makes it clear that an envenomation by a timber rattler is undoubtedly a medically serious event. But snake bites are vanishingly uncommon. Moreover, the vast majority of people who do get bit are harassing the snakes – and often intoxicated at the same time. In other words, even when you’re in rattlesnake country, you really have to go out of your way to get bit. Rattlesnakes only bite as a last defense and would much rather slither out of your way and save their venom for an unsuspecting mouse or chipmunk. A timber rattler coiled and ready. Defying the long odds, Levin accepts the challenge to convince readers that, despite our natural aversion to them, rattlesnakes are worthy of our awe and respect. Undoubtedly one of nature’s most impressive mouse traps, the timber rattler is evolution’s answer to the question, “How do you catch a mouse if you don’t have any arms or legs?” Equipped with an exquisite sense of smell, deadly accurate heat vision, lightning fast reflexes and a pair of hypodermic needles loaded with carefully customized venom, the timber rattler is an evolutionary wonder of the highest caliber. Chronicling his many adventures in rattlesnake hideaways throughout the northeastern US, Levin’s enthusiastic prose effectively generates a profound admiration for the evolutionary wonder in our midst. Levin also explores the history of our interaction with one of America’s most feared inhabitants. When Europeans first arrived on North America’s east coast, the timber rattler quickly caught their attention. Fear and loathing prompted the formation of a vigorous and well organized extermination program that has resulted in the disappearance of the snake throughout most of its natural range. But for those who know some of the secrets, snake dens can still be found in some surprising locales, even suburban Connecticut. Teaming up with local experts, Levin searches high and low for the timber rattler’s increasingly scarce holdouts against complete extinction. A black morph in Pennsylvania. He also documents much of the special cruelty that humans reserve for rattlesnakes of every variety. He seeks out religious snake handlers, unscrupulous collectors, ignorant thrill seekers and determined bounty hunters who have each contributed to the timber rattlers continued decline in their own unique ways. But he saves up his most potent venom for descriptions of his visits to various “educational” rattlesnake festivals, which serve as nothing more than lengthy torture sessions for the unfortunate snakes who are caught up in the revelries. Unfortunately, Levin’s storytelling is hampered by the covert nature of his activities. 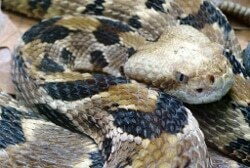 If he were to provide any sort of location-revealing details, malevolent snake collectors would capitalize on the information to wreak further depredations on timber rattler breeding dens. Sworn to secrecy by his sources, the author provides only the vaguest geographical details as he traipses across wild – and some not so wild – areas in New England. Along the way he reveals myriad fascinating secrets about the life of rattlesnakes, even providing data to show how having a healthy timber rattler population in the neighborhood can be beneficial for human health. An occasional fresh mouse, a warm rock to sun on and a deep, cozy crevice to wait out winter’s cold – that’s all a timber rattler really needs. Is it really that much to ask that we allow them some space to live their lives without harassment? Wide-ranging and eloquent, America’s Snake is Ted Levin’s simple and sympathetic plea for peace with rattlesnakes, before this natural wonder goes the way of the passenger pigeon. It’s time for humans to put their undeniably cruel traditions behind them. Enthusiastically recommended.